You know how sometimes you have this dream that just seems completely disjointed when you try to remember it later, but at the time, it all seems connected, like nothing could ever be out of place? I guess most dreams are like that. What’s odd for me is the image of the white owl that keeps fluttering through these dreams. I’ve never had a particular affinity for owls. I mean, they’re lovely, and I enjoy watching them, but they are creatures of air and I am a creature of water, inasmuch as I can be a creature of anything except pure magic. It began in a winter garden. I found myself dancing in front of a crescent moon. Not that that’s unusual or anything: I remember thinking at the time that it was probably a symbolic dream and this was all allegorical. Yeah: I even edit my own dreams. I’m an intrusive and unreliable narrator. It’s like the cast of a weird paranormal fantasy novel up in here. And of course the scene changed, like they do. And of course the scene changed, like they do. I was descending this weird staircase, which obviously led nowhere, but it made perfect sense at the time. Then I noticed this white owl around my neck, which only clocked because I keep noticing white owls turning up in my dreams everywhere. Then, another crescent, and a sense of profound disorientation. Then, another crescent, and a sense of profound disorientation. Where was I, anyway? Why was everything covered with snow? It’s summer. Obviously, not in Australia. But that was “real” world geography, something I shouldn’t even be measuring things by any more. So, yeah. Some kind of dream world and me all underdressed as I often am in dreams, but at least feeling comfortable. I’m sure I was wearing sandals, though I don’t think I ever looked at my feet. The scene changed again, and I was on some kind of pier, watching a ferry disappear into some kind of mountainous distance. Why was I even watching a ferry? Is that how I got tot this place? Frankly, it was even weirder than my usual dreams. Frankly, it was even weirder than my usual dreams. There was nobody around; the whole place seemed deserted. I made my way up a set of steps to a boardwalk. I made my way up a set of steps to a boardwalk. In the distance, there was this gorgeous house, and I promised I’d made my way there. On the boardwalk, it looked like there should have been a market in place, but again, there was no one to be seen. Stuff was just lying around as if all the inhabitants had just disappeared. I walked further up into the town. I walked further up in to the town and flicked my hair back from my— yeah, everything had changed again. The clothes notwithstanding, I felt completely out of place in this odd, deserted town. Where were all the people? I made my way to sort of an observation area that led to a smaller boardwalk. I made my way to sort of an observation area that led to a smaller boardwalk. I couldn’t keep my eyes off the house on the beach. It seemed so familiar, as if I should know who lived there, only again, there was no movement except for the waves against the rocks. I could hear birdsong, but I saw no birds. I let myself look out over the ocean for a few minutes. I let myself look out over the ocean for a few minutes. It really was beautiful. But then I got this strong feeling it was time to move on. More to explore, I thought; more to see. But then I got this strong feeling it was time to move on. More to explore, I thought; more to see. Again, the world seemed to spin. And it was the middle of the day, but I was dressed to the nines. And nervous. And it was the middle of the day, but I was dressed to the nines. And nervous. It felt like I was waiting for someone, someone important, but I couldn’t have told you who it was. The house in the background, again, that feeling of prickly familiarity, that I should know who lived there. And wasn’t there a house like that, sometime, some time ago, in the Bower? My old Bower, lost now to Faerie’s intermittent remaking of itself. The feeling of anticipation was heady, like that feeling you get when you’re waiting for a first date. The feeling of anticipation was heady, like that feeling you get when you’re waiting for a first date. What on earth was I doing in a little seaside town — at least I thought it was the same town, dressed like that and feeling like that? I’d even brought out my best jewels for the occasion. I smelled something; was it moss? More than the flowers all around, this was a wet smell. As if everything was wet. And then I was walking out the door of a grocery store? And then I was walking out the door of a grocery store? What was that all about? And wow, torn jeans, and a feeling of comfort, of belonging, like I lived here… and yet still there were no people No one. Fresh fruit and veg for days, and no one to buy it. Fresh fruit and veg for days, and no one to buy it. What was that about? I felt comfortable just picking something up and taking a bite, though. I think it was a cherry. No pun intended. So. That house. I had to find that house. I spotted the chimney in the distance and plotted a path. But before I got there—just before I got there, as a matter of fact, I stopped short. There in the front garden, or what might have been the side garden, of this house, was a statue. My statue. The one I bought at the Great Faire auction for … well, for quite a lot of gold, and I won’t say how much. The statue of the harper, called “The Last Hope”. What was it doing here? It felt like I stood there for hours, wondering. Then, I turned and walked toward the house, which appeared from a short distance to be completely empty. And I woke up. Without ever seeing the house up close. So much for the mystery of why my statue was outside. Spiffy photos taken with the indispensible aid of my LumiPro. I never have disturbing dreams without it! When I found myself in Tinker’s Hollow, I was at first too overwhelmed to take it all in. The darkness of the landscape was contrasted by bright bean-shaped paths in some places and wide roads in others, dirt paths into which something seemed to have been inscribed in yet others. To be honest, I was confused. I felt dizzy, displaced, possibly a bit drunk. One arrives on an airship, after which there is a long flight of spiral stairs: this might have contributed to the feeling of dizziness, but I can’t be sure, because it’s hard to be sure of anything in Tinker’s Hollow. For example: was that really a giant red teapot house? For example: was that really a giant red teapot house? I mean, obviously it was a giant red teapot house: I was looking at it. And the floating cups, and the smaller floating teapot, and a strange newspaper headline, and … well, everything was brightly coloured, or at least it was just here. What sort of Realm had I stumbled in to? What sort of Realm had I stumbled in to? It was unlike anything I’d ever seen, like a picture book inscribed upon a landscape of night-dreams, but all the denizens seemed to be awake, alive, busily going about their lives. I suppose if you lived in such a Realm, you’d become used to the scenery. In the day (I think it was a day; it’s hard to measure time in Tinker’s Hollow) I was there, I never stopped coming upon things that surprised, delighted, and even scared me a little. Of course, as with all the Fairelands Realms, the shopping was amazing, though the feeling of dizziness never subsided,the whole time I was there. In fact, I wondered to myself if it might not be an intentional atmosphere of putting visitors off-balance. Perhaps confused people buy more merchandise. If I were back in London, I’d just Google that and see if there were any statistics on it: for myself, I can only say that I came away with an astounding number of wild headdresses and crowns from a shop called Love. Though I didn’t wear any of these trinkets while in Tinker’s Hollow, I can’t wait to try them all on and see how good my decisions actually were while in the Realm. Maybe when my head clears I’ll realise I’ve made huge purchasing mistakes. Then again, maybe they’ll just bring back the sense of delight and wonder the whole Realm evokes. Somewhere on a high hill in the Realm, there was a carousel of unicorns! Somewhere on a high hill in the Realm (and I couldn’t tell you how to get back there now!) there was a carousel of unicorns! Inside the circle of the carousel, I found statues of fae creatures (or maybe they were real, and just being very still: I could have sworn one of them had fluttering wings! ), sunflowers, a host of glowing plants. It all seemed so comfortable and happy, like a child’s daydream. While the feeling of dizziness stayed with me, I became more and more comfortable with the landscape as I travelled through the realm. I could have sworn this tree was topped with candy floss. I could have sworn this tree was topped with candy floss! And the glowing flowers reminded me of nothing so much as our Will-o-the-Wisps, come out to bring messages. None of them spoke to me. In fact, despite the assault of colour and movement, and some music at the carousel, the Realm seemed silent to me. Of course, as my memories fade, I’ll never know if that was completely true or if my system just couldn’t process so many things entering it at once. It did all begin to seem like a dream, but more of a day-dream than the asleep variety. I wondered what Richard would have made of it: he probably would have suggested that recreational drugs would enhance our experience. Of course, with my heightened Fae senses, I have absolutely no idea what drugs would do to my system at this point, or if they’d have any effect at all. On the first view to say…. Yeah. It was definitely time to go home for a rest. Tomorrow I’ll seek out a bright land, a simple land, a Realm with no talking mushrooms and a straightforward path from end to end. I might even do it as a different person. I do hope no one heard me. Spiffy photos taken with the indispensible aid of my LumiPro. 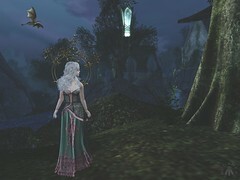 I never explore the Fairelands without it! Another day, another Realm. So much to see. I remain in awe of the magicians and sorcerers who bring the Realms together each year for the Great Fantasy Faire. This morning found me in Lucentia, a city of dark wood and glowing lights, full of the most interesting people. The whole city seems to be powered by some kind of magical crystal set just offshore, in their harbour. I’m intrigued by this kind of magical power: I wonder if we could use the crystals on the Wylds Tree to power things like streetlamps in Mysthaven, that sort of thing. Then again, I’m not 100% sure exactly how Mysthaven is connected to the rest of the Wylds, but that’s another question for another time. Away from the city, there are a couple of lush forests. Away from the city, there are a couple of lush forests. Even far out from the city itself, the glowing crystal is visible. I think the spires on top must be some system of providing magical power through the air, but the city planners never seemed to be around when I tried to reach them. I’ll do some research: Nathaniel will enjoy digging in to that, particularly if I promise not to put an espresso machine in our cottage! From a distance, the city appears to be a massive cluster of buildings and shops. From a distance, the city appears to be a massive cluster of buildings and shops. When I first arrived there, I asked myself where the people all lived. It’s not hard to get a house party invitation when you’re a Queen. It’s not hard to get a house party invitation when you’re a Queen. I asked around a bit, found out where the Fae quarter of the city was, and then I just started talking to people. I find that people are always excited to tell tourists about their cities; you have only to ask. On the rooftops of Lucentia, there are houses! On the rooftops of Lucentia, there are houses! Hundreds of them, small and large, flats atop flats, houses atop houses. Each one is a compact entity all of its own. This house belongs to a cousin of the Fae Prince of the city, and he was only too happy to invite me in for tea. He had loads of question about the break up of our Realm, and he seemed very interested in how the politics of my reigning over both Courts of Faerie in our Realm. We spent a very pleasant evening together; there was tea and cake and dancing: Lucentia has a large store of mortal musicians who are only too happy to play for a Fae party. As always, when I spend time with people in other Realms, I enjoy thinking for a little while about what it would feel like to live there. But in the end, when the music’s stopped and the cake’s all eaten, I’m happy, when I think about it, that I have my own Realm to go home to after the Faire’s over. But in the end, when the music’s stopped and the cake’s all eaten, I’m happy, when I think about it, that I have my own Realm to go home to after the Faire’s over. The Prince, whose name I won’t record here, was smooth and charming, as so many Princes are, a fine dancer, and a good judge of wine, though the cakes were not sweet enough for me. Funny: I remember not liking cake when I was young. Once I’d Quickened, everything changed. I’m on what my (adoptive) mother would call on a sugar economy now. I admit, I felt a little tired when the evening was done. I admit, I felt a little tired when the evening was done. We don’t have enough parties in Wylds for me to be properly resistant to long nights of dancing and carousing, though to be honest there wasn’t much carousing. I think the Prince would happily have taken me to bed, but I had no desire to unite with him, despite his charm and (duh) good looks. But as always during the Faire, tomorrow is another adventure. Sometimes, the Faire seems as if it will never end, though with every day there is the rising knowledge that it will end one day sooner. Anyway, yesterday, I found myself in the Realm of Breeze. It was like walking in to a storybook, the sort of place you never want to leave. It would be hard to have even a moment of melancholy in such a place. I found this glorious little dress from Jinx, and, from a newly discovered headwear designer (Love) that I’ll talk more about as the Faire goes on, a gorgeous butterfly crown. The most lovely iridescent wings from Soul kept me soaring, and of course I could never be myself without Lumae‘s amazing skin painting and a morning trip over to Analog Dog to put my hair together. That Queue Marlowe is a genius, I tell you, and her Faire styles are second to none. I could have spent an hour just standing among the trees, looking out on the landscape. I could have spent an hour just standing among the trees, looking out on the landscape. It’s a good thing glamoured skin doesn’t burn: the pink skies and constant sunlight might have made a red mess out of me if I were a natural redhead. Instead, I come with more magical protections than a £90 Estee Lauder sun cream. It really is good timing this year, the Great Faire. It really is good timing this year, the Great Faire. I do not relish the thought of going back to Wylds and having to handle life in such a narrowed environment. I do not think I shall ever see my magnificent tree-house again, for example, and the Great Seelie Forest is but an impression on another floating island. Oh, but even a moment’s thinking about that threatened to turn me maudlin. Oh, but even a moment’s thinking about that threatened to turn me maudlin— and as I’ve already said, it’s impossible to be maudlin in the beautiful world of Breeze. Nope, forget those thoughts. Forget thinking about my own Realm. Nope, forget those thoughts. Forget thinking about my own Realm. Forget the absence of Maric, that last terrifying dream from Gwythyr Gwynn, forget it all. Forget everything but the Realms and the shops and the dancing, just for a little while longer. So I wandered toward the centre of the realm, where I discovered a massive tent! So I wandered toward the centre of the realm, where I discovered a massive tent! Outside, there were huge balloons. And I don’t know about you, but whenever I see balloons, I just want some myself. And you know what happens with a Queen of Faerie wants something. In my hand there appeared suddenly a lovely brace of star-shaped balloons! And of course, you know the rest. And of course, you know the rest—or can guess it. I must have flown around Breeze for half the day, dipping down in to shops, letting my wings and the balloons take me where they would. I’ll be sad, somehow, to go away from such a beautiful land. But I’m sure an equally wonderful adventure awaits me tomorrow. It’s easy to get the idea, when you visit here once a year for the best shopping in more worlds than we small dwellers upon them can count, that all of the Fairelands are a bright, cheerful, or at least beautiful, place. This is not true. I think every year there’s a Realm I feel more at home at than in any other. I think every Faire, there is a Realm I feel more at home at than in any of the other Realms. So far this time around, it’s the beautiful, green, overcast Serenity. I love its monuments and candles. I love its harbour, its waterfalls. But the fact is, for me, the Great Fantasy Faire is a shopping trip. It replenishes my dress wardrobe for the year to come, not to mention my jewellery stash. I learn how to do new hairstyles. I take cosmetic workshops. I buy shoes. Last year, I bought a replica of Rapunzel’s tower; I kid you not. It was too tall for the bower and not very practical at all: it had only the one room at the top, you see. I don’t know why I bought that. But it’s in inter-dimensional storage now, with more stuff than you probably want to know about. Anyway. Yes. The Great Faire. I was saying. It’s a shopping trip for me. And I’d shopped up every shop I wanted to shop in Serenity, though I’ll likely come back there for a peaceful stay once I’m done with all the shopping. One of the shopkeepers told me I could hail a boat from the Serenity Pier, and that my closest, best, shopping destination was Dangarnon. Which is what I did. Journeys in the Fairelands always seem almost impossibly short. Journeys in the Fairelands always seem almost impossibly short, and this one was no exception. Still, I did have time to change into something a little more fun and a little less formal for a day of shopping. “Do I catch the boat to Dangarnon from here?” I asked the fellow who helped me off the boat. He laughed. “Lady, this is Dangarnon,” he said. “That’s right, Lady,” he said. Some of the other crewmen were laughing now, too. “Malfience, sir!” called the little fellow who started laughing first. I was still sceptical. I mean, look at the place. But sometimes I can’t solve everything with magic or a quick wit, so I shrugged. And I turned away from the sniggering, coarse, impolite lot of them, and I marched into the town as if it were the coolest place I’d ever set foot in. And you know? It kinda was.